Lorene Holland Lumpkin, dedicated Christian servant, spouse and mother of three, passed away peacefully in her home on April 2. She was 102 years old, preceded in death by her husband, Rev. J. Oscar Lumpkin, in 1994. A memorial service will be held at 11 a.m. Monday, April 8, at Forest Hills Baptist Church, 2101 Old Hickory Blvd., Nashville TN. That follows burial on Sunday in a family plot in Cedar Grove Cemetery near Sardis in rural West Tennessee where she was born in 1916, the youngest of nine siblings. She is survived by her two sons, John Lumpkin of Richardson TX and Charles Lumpkin of Greensboro NC, and daughter, Cynthia Lumpkin, with whom she made a home in Franklin after Rev. Lumpkin’s passing. Also surviving: grandsons John J., David, Robin, Michael and Andrew and 12 great-grandchildren, all but the youngest who gathered from Kansas, Virginia, and Colorado to celebrate her 100th birthday in 2016. She and the late Rev. Lumpkin were pioneers in urban social ministry for the Southern Baptists, founding or expanding mission programs beginning in the mid-1950s in Nashville, Alexandria VA and Fort Worth TX. They both were commissioned Southern Baptist Home Missionaries. Their remarkable stories began on small farms near Sardis and Whiteville, where they graduated from high school to become the only ones in their immediate families to earn college degrees. That happened at Union University in Jackson TN, where they first met, both working their way through school. They then studied at Southern Baptist Theological Seminary in Louisville KY. She taught school and reared children while her husband proceeded with a traditional career as pastor of churches in Shelbyville, Springfield and Nashville before going into full-time urban mission work in the poor neighborhoods of north Nashville. Her teaching for Nashville public schools included a special unit for mentally and physically challenged students, often with severe afflictions. She and her husband were recruited as a team to launch a weekday and Sunday ministry for the First Baptist Church of Alexandria VA in a declining area in 1961. They were called to Fort Worth to do the same for Broadway Baptist Church. In addition In additional to spiritual instruction, they organized free dental care, food and clothing services, child care and other provision for basic needs. Their next assignments were in Orlando FL, where she continued as a Home Missionary and she became director of Baptist social ministries for the region until his retirement in 1981. In her adopted home of Franklin after she was widowed, Lorene Lumpkin became an institution at Forest Hills Baptist Church, volunteering and serving as a Sunday School teacher for multiple generations. 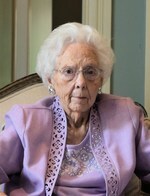 She cared for her gardens, sewed family heirloom quilts, cooked traditional Southern meals and welcomed extended family into her daughter and her home, remaining active and self-sufficient well into her nineties while daughter Cynthia pursued a publishing career at LifeWay Christian Resources. Dr. Charles Lumpkin, a retired U. S. Army Lieutenant Colonel in the U.S. Army and an ordained Baptist minister, will officiate at his mother’s burial service. Dr. Sam Boyd of Forest Hills and Dr. Jerry Winfield will officiate at Monday’s memorial service. Donations in her memory may be made to Scotts Hill Baptist Church, 580 TN-114, Scotts Hill, TN 38374; Forest Hills Baptist Church, 2101 Old Hickory Blvd., Nashville TN 37215, for its “Engage” Mission Project; Alive Hospice, 1710 Patterson St., Nashville TN 37203.